LA JOLLA—A team of Salk Institute researchers led by President Rusty Gage has been awarded $19.2 million over eight years by the American Heart Association-Allen Initiative in Brain Health and Cognitive Impairment to investigate mechanisms underlying Alzheimer’s disease and aging-related cognitive decline and uncover new therapies. This bold venture will comprehensively analyze interactions between five areas key to brain health: proteins, genes, metabolism, inflammation and epigenetics. This image represents how the Salk research effort will comprehensively analyze interactions between five areas key to brain health: proteins, genes, metabolism, inflammation and epigenetics. The Salk team aims to study how failure in any one of these systems can cause a domino-like crash that results in devastating brain disorders like Alzheimer’s. 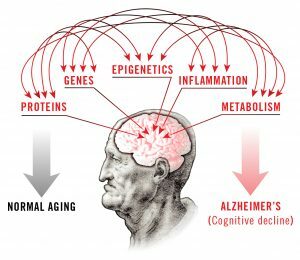 An aging-related disorder that results in severe memory loss, Alzheimer’s disease represents a global health crisis with estimates suggesting that 130 million people will be affected by 2050. To date, there are no therapies to effectively treat the disease. To respond to this critical need, Gage will be leading a multidisciplinary team of 10 Salk scientists, all luminaries in their respective fields across metabolism, immunology and inflammation, genetics and epigenetics, and protein analysis. The all-star interdisciplinary group believes that Alzheimer’s and other age-related brain disorders are triggered not by a single event, but by a failure of complex, interdependent biological systems in our body that start to break down as we age. Failure in any one of these systems can cause a domino-like crash that results in devastating brain disorders like Alzheimer’s. By studying the networks that keep our brains healthy, the team aims to reveal new targets for therapeutic research and biomarkers of early stage cognitive decline. 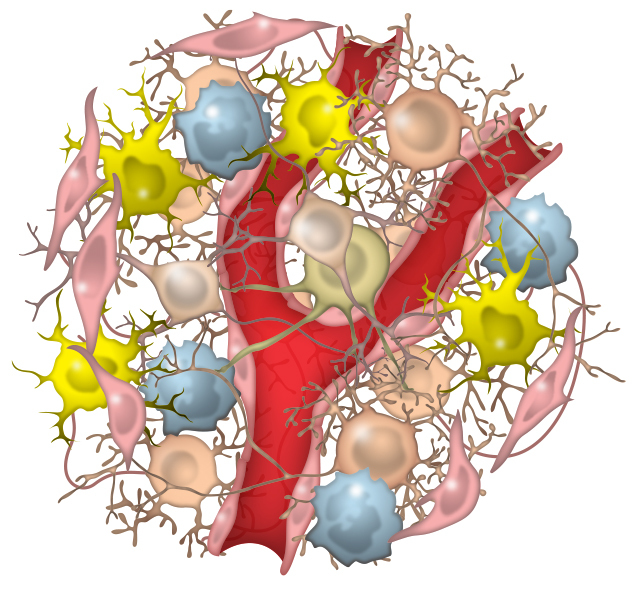 This illustration shows a blood vessel traversing neurons and support cells called glia in a brain organoid, as recently described in research from the Gage lab. Improved 3D models of brain function can better approximate both health and diseases such as Alzheimer’s.